Press section is mainly used for further dewatering the wet paper stock. It includes Suction Press Roll, Felt Guide Roll, Doctors and etc. 1. Continue dewatering paper stock in phicical way. 2. Compress paper to increase tightness, and then the strength will improve. 3. Improve paper quality; remove the trace of wire and felt; improve smoothness. According paper & slurry types and other actual production requirements, the instruction of press section is different. About the arrangement of press section, the following questions should be considered. 1. Achieve the maximum dehydrating amount. 2. Achieve the maximum working efficiency and running rate. 3. Will not damage paper. 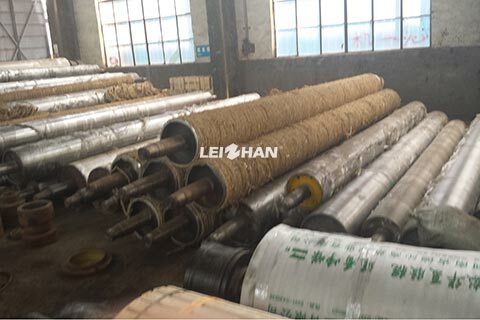 Leizhan provides various kinds of paper and pulp machine.Welcome to contact us for mare details.